Plaza Blanca is one of those places you go to unplug, to disconnect from the hecticness that is everyday life and reconnect with yourself or nothing at all. 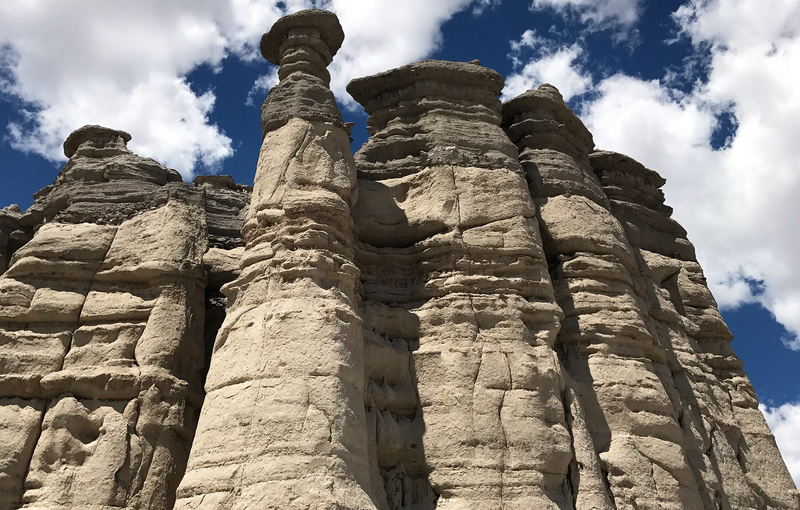 Dramatic white rock formations collide with a seemingly endless horizon and give Plaza Blanca its name, which is Spanish for the “white place”. What makes this site so interesting is the contrast of texture and light you’ll find among the soaring rocks that have been cut by wind and water for centuries. The terrain is almost otherworldly and the views are not to be missed. American artist Georgia O’Keeffe was drawn to this area in northern New Mexico for these very reasons, capturing Plaza Blanca and the surrounding landscape in her paintings. 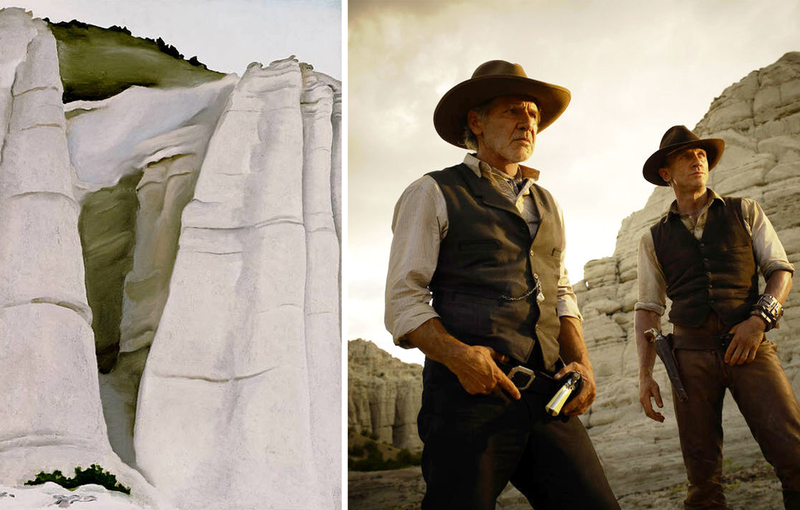 And more recently the site has served as a backdrop for several Hollywood movies including Cowboys and Aliens starring Daniel Craig and Harrison Ford. Despite this “fame” what I particularly like about Plaza Blanca is that it’s relatively under the radar, with no roadside signage announcing its location or where to turn to reach its small parking area. On the gorgeous weekend day we visited we had the site virtually to ourselves (one other car was leaving as we were coming), which further added to the experience. And with its proximity to Albuquerque (2 hours) and Santa Fe (1 hour), Plaza Blanca makes for a great half day hike. You can see more of my photos in the gallery at the end of this post. Located on private land owned by the Dar Al Islam mosque and education center in the Rio Chama valley, Plaza Blanca is accessible to the public and a fairly straightforward drive via mostly highways. From Albuquerque, take I-25 north in the direction of Santa Fe and exit at NM-599. Continue on towards Española on US-84/US-285 and look for the sign for El Rito and a place called Mamacita’s Pizza on your right. Turn here and then make an immediate left onto County Road 155 as soon as you cross the small river bridge. The last stretch of the drive is a little bumpy and you’ll want to keep an eye out for a big wooden gate with the words “Dar Al Islam” written across the top. Turn right here and continue to bear right until you reach the parking lot for Plaza Blanca. Read more detailed directions here or reference the map below. 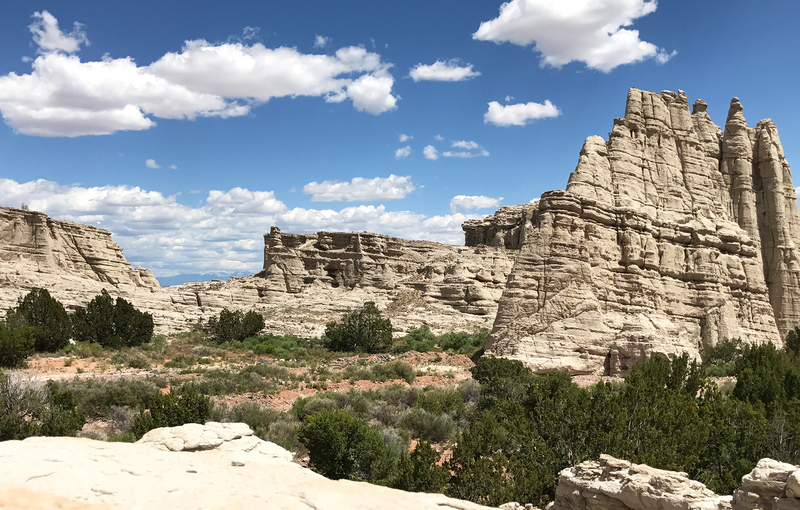 Hiking at Plaza Blanca is relatively easy and can range from a peaceful walk through the former river bed or a climb up some of the flatter rock formations. Either way, sturdy shoes are recommended. And since the area is open with very little shade a hat, sunglasses, sunscreen and water are a must. You can easily spend up to 2 hours at Plaza Blanca and even more time exploring the surrounding area. Other nearby sights include Ghost Ranch (where O’Keeffe lived prior to building her house in Abiquiu), the Georgia O’Keeffe Home (a 5,000 square-foot Spanish colonial era building the artist renovated and resided in from the mid-1940s through the mid-1980s), the Village of Abiquiu, Abiquiu Lake and more. Art lovers can keep with the O’Keeffe theme and visit the Georgia O’Keeffe Museum in Santa Fe. The city also makes for a nice place to overnight and extend your time in the area, where art, culture, nature and food options abound. If you’re just passing through, you can also stop for food in Española and fuel up with quick, easy and delicious New Mexican food at the no frills El Parasol (look for the little white shack with picnic benches) or the adjacent El Paragua restaurant as a more formal but equally as authentic dining option. Loved your article on Plaza Blanca. I’m planning on visiting Plaza Blanca this spring on my way up to Moab. I will be hauling a 30ft camper and am curious just how bumpy the dirt road is that leads to the trailhead? I really don’t want to miss seeing this area. Thanks! Hi, thank you for reaching out! The dirt road is relatively flat (the dirt is hard but it’s not rocky, you can get a sense of the terrain in the first photo of my gallery with the Dar Al Islam sign) and not very long (just over a half mile), so I think you should be ok with the camper. I consulted with a friend of mine that has visited many times and he agrees. I hope you have a great time on your trip to Moab this spring and please do let me know if you make it to Plaza Blanca! My husband and I are photographers. Can we visit Plaza Blanca at night to do some astral photography? Hmm, that’s a good question. There isn’t an official website for Plaza Blanca so I’m not sure if there is a closing time in the evening. It’s located on private land owned by the Dar Al Islam education center, so maybe try contacting them? http://www.plaza-blanca.com/photography.html Good luck and keep me posted on what you find out!